An invitation from the newest collection. The cover is in the form of a jacket, made from black matte paper, finished in a wave. 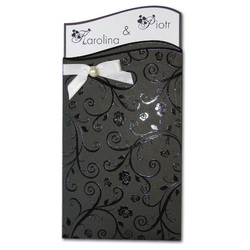 Rich embossing are covered in black, shiny foil. The insert on which the text is printed is white, also finished in a wave. It is rimmed in black. An additional decoration is a white satin bow with a pearl. The envelope is matte and white.